Sing bingo is one of the few bingo sites that have a unique hook; this site has a musical theme which offers a musical atmosphere and prizes. The site certainly is interesting to look at and seems unique from the outset but will it all be over before the lights go down? Oh no there is plenty on offer at sing bingo. As soon as you arrive at the site you will notice that the design veers away from girly pink making it a unisex site that can be comfortably enjoyed by all, we love the rock star that appears in several places, including the footer where a he grips a rose between his teeth. The logo has the tagline 'The Star of Free Bingo', a feature that runs deeply throughout the site. Other mottos on the site read 'Play Free bingo, win real cash' - there certainly is no hard sell here, but the message is pretty impressive all the same. All vital information can be found at the top of site, from here you can view promotions, receive help, access games and look at the upcoming memorabila games - a nifty feature we will come to later. Once you have logged in and deposited you will be able to play in the ‘Make your debut’ room. This is a free room with a £20 jackpot, games run every quarter of an hour. This is a great idea as it allows newbie’s that chance to get used to the site without playing for money. The other rooms at Sing Bingo also have musical names; these include the record breaker room and the after party. 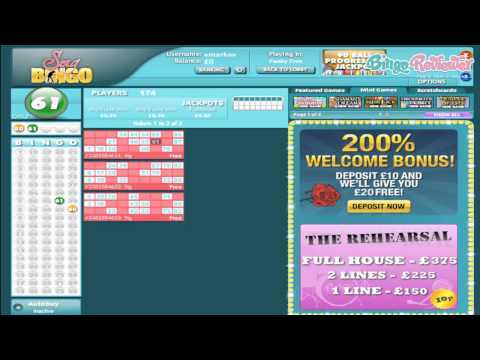 We love how the graphics and rooms all follow the sites main theme; it’s a refreshing change when compared to other bingo sites of late. Free bingo is offered in six rooms around the clock, even the pay to play bingo is cheap and stays true to the sites tagline. One of the most exciting and unique promotions at sing bingo happens every Friday and gives players the chance to win some amazing musical memorabilia. These include amazing prizes like signed gold disks or even rock stars guitars. These really are money can’t buy prizes and make a refreshing change from sites that just give away bonus bucks and the like. Players can also refer a friend, if a friend signs up and makes their first deposit you will be rewarded with an additional £15 in bingo funds - not bad for bringing a friend to the party. We really like Sing Bingo because it has a unique flavour to it. The sign up offer is pretty generous and the chance to win pop and rock goodies is amazing, for many it has become a regular addition to their bingo timetable - especially on a Friday night. I really like Sing bingo, unlike other sites they have a theme running through the whole site. What i mean by that is, there is a music theme on the homepage and then in the lobby, bingo rooms and even the prizes. Some sites simply have a themed homepage, I don't think this is good enough. Sing bingo has music running through the whole site. I love it. i think this site is brilliant with the prizes offered. They have given away legendary rock n roll stars concert tickets, guitars and priceless memorabilia! I played my heart out trying to win that XFactor karaoke machine. Sing Bingo offers great bingo and greater prizes! Sing Bingo is a hit in the bingo world, that's for sure. I really like their mascot, the Rock Singer with his funky hair and huge smile. He is a very welcome host for this site that prides itself on offering free bingo with no credit card required and does not require it's members to deposit in order to play bingo for real cash money prizes. New members are also given a nice 20 pound no deposit bonus as well as more bonus money when depositing. You don't only win cash here, they are also giving away music memorabilia, concert tickets, and other top items just right for your musical entertainment as well as your bingo fun. Play 75 and 90 ball bingo here in 30 different rooms and try to be sure to get in on the progressive jackpots that are itching to be won at Sing Bingo. You can also play casino games like roulette and slots. The promotions just are overflowing here like jazz spilling out into the night. Scoop some up for yourself and enhance your bankroll so that you can play more. Just one more card might be the right one! The theme at this site is really fun and entertaining! Another thing I noticed upon joining was their welcome offer. It’s not bad at all. They start you off with a no deposit bonus and just for joining the site, they give you £10 free to play with. When it comes to their games, they offer players the standard bingo varieties: 75 and 90 ball. However, they spice them up with awesome progressive and guaranteed jackpots. You can’t go wrong with the free bingo at the site. You can play free versions of both 75 and 90 ball all day, every day. They also have 5p and 10p rooms available for each type of bingo as well and cards are just 1p. The site also features a total of 70 instant games that can be played at the same time as the bingo games. I love when this is available because it makes your experience all the more exciting. Sing Bingo has a lot of it going on with the whole Sing theme, and it's actually one of the very few themed sites that I really enjoyed. Just to know, you can get some great music memorabilia, even win some. Start off with a £10 no deposit bonus, which I always use to get to know the games and get a feel of the site itself. I contacted the support to check them out, and I was really happy to talk to the team who was informative and helpful at the same time. They answered all of my questions and in the end I had a feeling I had a chat with a good friend. They have a mobile site version, great graphics and it looks impressive on the newer phones and tablets. I do wish they had a little better Bingo offer, since they only have a 75 and 90 ball games available. Other that that, this one is a keeper. I definitely love playing here. They have a whole lot of goodies to offer. Their nice welcome offer has already been mentioned and I definitely agree that this is a nice little plus when you sign up. It may not last very long, but at least they give you a chance to begin playing some of their games for free. It’s really easy to register here and it can be done in just three simple steps. Aside from their really fun layout, I am a big fan of the promotions they have to offer. Their deals can easily be found on their “Promotions” page. Free bingo is most definitely accessible. In addition to this, they also have exciting instant tourney marathons. These can be found every Friday. Another awesome thing about the site is that they offer a mobile version. This makes it super easy to play whenever and wherever!